Buying your first golf cart is a very exciting purchase! There are many different carts and even more features to consider before choosing which brand is right for you. This isn’t necessarily a case of the more features and the more expensive the better. There are plenty of other things to consider and in the following article I will break it down as best as I can. Chances are you started off playing golf with a push cart – I most certainly did. In fact, even those who have powered golf carts will choose to walk a course from time to time with the best golf push cart. That aside, with a powered cart you are going to save energy and a lot of time while playing golf. The ease of driving straight to your ball, choosing and playing your club then driving again makes it a whole lot simpler. Both great options, there are a few differences between the two golf carts. Mostly, like many golf accessories it comes down to personal preference. In terms of operating costs gas and electric end up costing the same. An electric cart requires battery replacement every 5-7 years on average (depending on how often they are used). A gas golf cart requires oil changes, belts, fuel and filters. So factoring these costs in they are more or less the same to run and maintain. Cost aside, let’s have a look at the pros and cons of gas and electric golf carts. Golf carts come with many different features, regardless of it is electric or gas. The biggest consideration is the passenger capacity. This aside there are actually a few other things to consider. While some of these features aren’t essential they are an added luxury, so again these features are a personal choice. It can be a good idea to check the safety features including if it has seat belts and roll balls in the case of a roll. Brand new golf carts will change depending on the features you add or are looking for. For a basic, standard model you can expect to pay around $4,000 but well up to $15,000 if you want all the bells and whistles. Between these price ranges you will be able to find a comfortable, quality cart that can sit upwards of 2 passengers. Where was the Cart Made? Within American, there are three primary carts on the market, they are the Club Car, E-Z-Go and Yamaha. If you are within America and purchase one of these carts then maintenance, replacement parts and accessories are readily found. For carts made in China, it can be difficult and in some cases impossible to source replacement parts. For modern gas and electric carts the great news is they are equipped with a hour meter or amp hour meter. If you purchase through a dealer they will be able to read this and let you know. A gas golf cart will last 5,000 to 6,000 hours when taken care of properly before a refit would be needed. An electric golf cart on the other hand will last 40,000 to 50,000 amp hours. This depends on the golf cart you buy, but be sure that your purchase comes with the owners manual. Every cart requires different care so be sure to read the manual thoroughly to understand this. Originally golf carts were made with a 36 volt system however nowadays they are predominantly 48 volts. Why 48 volts? Well this is the most efficient voltage and will offer the best performance for the cart. However, if you want the best performance there is such a thing as a 72 volt system, they are significantly more expensive. Golf cart batteries actually have a date stamped on them. You can find it either on the lead post or on the decal attached to the battery. Say the battery has D7 stamped on it. The letter refers to the month, A= January B=February C=March, D=April… and the numbering 3=2013, 4 = 2014, 5=2015 and so on. So D7 would be April, 2017. The date stamp is important because even if the cart is brand new, it may have been in storage for some time before being dispatched. This would mean the batteries have aged. High quality batteries can last up to 5 years, whereas low quality or cheap batteries may last up to 1 year. When it comes to finding a high quality brand of battery I recommend Trojan, US Battery, Crown, and JCI. In addition to this, if you purchase a high quality battery it should come with a 18 month free replacement policy should something go wrong. There are pros and cons of buying a new or used golf cart. A brand new cart is going to cost a lot but just like buying a brand new car you know exactly what you are getting and that everything is functioning as it should be. A used cart is going to be significantly cheaper and if you do your homework and ask the right questions you can find a bargain. Let’s take a look at the key things to consider when buying a new or used golf cart. When purchasing a used golf cart the biggest thing is that you’ll save yourself thousands of dollars. This is great but you will also need to be mindful of a few other things such as maintenance history, parts and whether it still has a warranty. The more questions you ask the seller the more equipped you will be to make an informed decision. Lower Price – Second hand golf carts are significantly cheaper than brand new ones. From around $1,500 you can get yourself a great deal. If you are budget restricted then this is great news. There are many carts who have been taken care of very well over the years and others that have been refurbished and seem brand new! History of the Golf Cart – The lifespan of a golf cart is actually very long (with the proper care). There are many carts that are still going dating back to the 80’s. Investigating the maintenance history will allow you to see just how well the cart has been cared for. Another thing to consider is the batteries, have they been replaced and how old are they (if you are buying an electric one). Also, ask the seller where the golf cart is normally stored and if they aren’t they first owners ask about the previous history. Test Drive – Take the golf cart for a test drive and pay attention to any leaks, noises and how it drives in general. If you can, take someone who is experienced or familiar with golf carts and see what they think. Included Accessories – As the accessories are interchangeable the parts that are included shouldn’t make or break the deal. The great thing is that a used cart will often include high quality accessories at a fraction of the price! When buying a new golf cart you know exactly what you are getting and anything that goes wrong is covered by warranty. Choosing a new golf cart is a matter of setting your budget and finding the best cart within that price range. Warranty- One of the best things about buying a new cart, the warranty it comes with. Either from the dealer or the manufacturer, the warranty offers buyer peace of mind. Depending on the cart and who you buy it from, the length of the warranty will differ, so consider how long the warranty is for before making your purchase. Customization – Buying new means you can personalize your accessories and add in another option features you like. Price – A new cart is going to cost a lot more than a second hand cart so shopping around and comparing brands and prices is advised. No Accidents – Buying brand new means you know the history of the cart and that there have been no accidents before you. 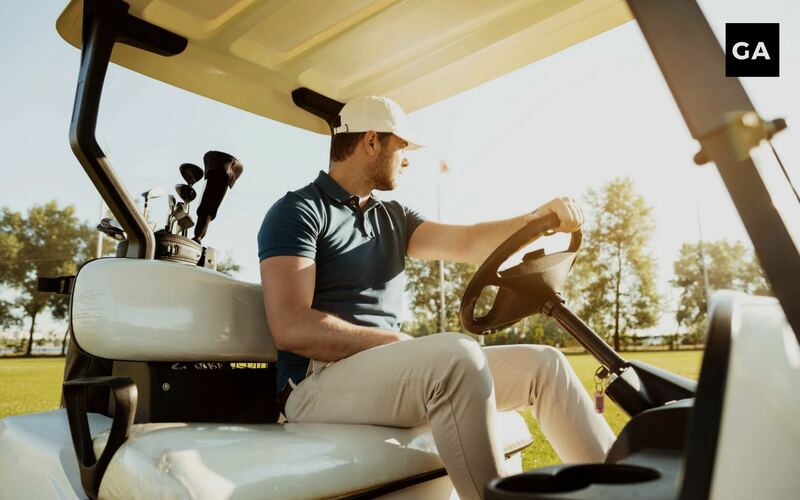 Choosing the best golf cart doesn’t need to be challenging, whether thats brand new or second hand. Determine what it is you want in a golf cart, the features and your price range then see what you can buy. Buying second hand means you will save a lot of money but buying brand new means you have buyer peace of mind. At the end of the day it comes down to your personal preference.